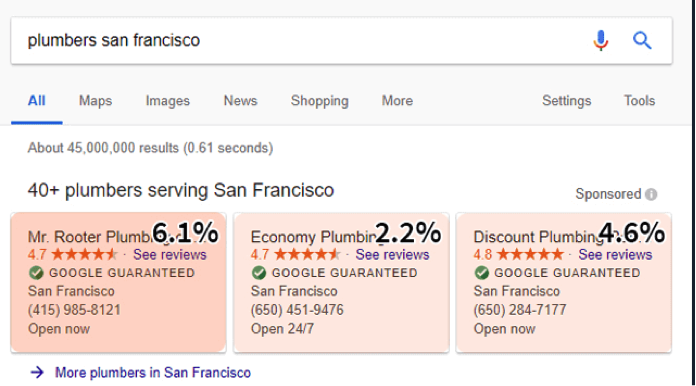 ContentHow Do Google Local Service Ads Affect Clicks For Plumbers? 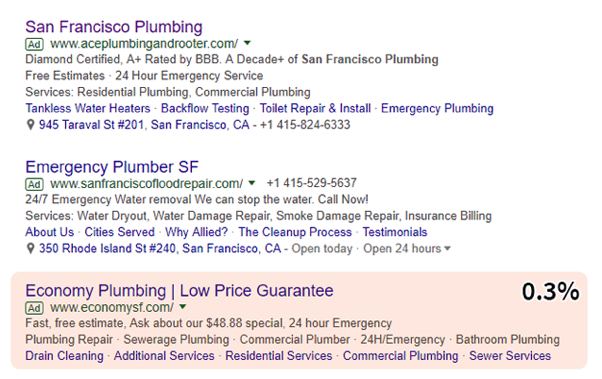 How Do Google Local Service Ads Affect Clicks For Plumbers? Google’s Local Search Ads (LSAs) have rolled out for plumbers and HVAC contractors in over 70 markets, but they’re still relatively new to the scene. Like most of the marketing world, we’ve been wondering how LSAs would affect clicks for other areas of the search engine results pages (SERPs), and thanks to BrightLocal, we now have some data to pick through. BrightLocal recently published a study on SERP clicks with and without LSAs for locksmiths, garage door contractors, house painters, plumbers, and towing companies in the San Francisco area. We’ve parsed through the results, outlined the plumbing vertical stats, compared the plumbing results to the average results across verticals, and put together a few key takeaways. Whether LSAs have rolled out in your area or not, this is info you’ll want to check out. The study we’re pulling data from compared clicks in SERPs when local service ads (LSAs) were present and when they were absent. We’ll be looking at those differences. Keep in mind that this study only looked at plumbing businesses in the San Francisco area. Results can and will likely vary depending on where you’re located in the U.S. For example, Yelp is an incredibly popular directory site on the West Coast, so it’s no surprise that it held the first spot in organic search results. That may not happen in other areas of the country. This study only evaluated click rates on desktop, not mobile. If LSAs haven’t yet rolled out in your area and you’re not sure what we’re talking about, they’re ads that allow “Google Guaranteed” businesses to get leads directly through Google. They’re not the same as Google pay-per-click ads (PPCs) because you only pay for qualified leads, not clicks. For a rundown on what Google Local Service Ads are, what they look like, what’s considered a qualified lead, and more, check out this tutorial that was published back in March 2018. We do throw out a lot of numbers and stats, so if your brain gets a little mucky or you just haven’t had enough coffee yet to dive deep, skip ahead to the takeaways at the end of each section. While they may be new to the scene, LSAs are getting some clicks, and we expect that clicks will increase with searcher familiarity. What are the current stats? When they were present in the local plumber search results, they accounted for 12.9 percent of the clicks. The very first LSA (the top left ad) received 6.1 percent of those clicks, while the third spot received 4.6 percent, and the center spot received 2.2 percent. Both the first and second business had a review rating of 4.7 stars, while the third business had a review rating of 4.8 stars. What’s noteworthy about these results when compared with the overall results of the study (which included four other verticals), is that on average, the LSA in the second spot got more clicks than the LSA in the third. This was not so with plumbers. So what caused things to differ for plumber LSAs? Well, the slightly higher review rating that the third business had could have been the reason for the extra clicks, but it’s also possible that the word “Discount” in the third LSA was more enticing than the word “Economy” in the second LSA. The takeaway: If LSAs are available in your area, it’s worth experimenting with them because people are clicking. But even if they’re not yet available, work on getting your review ratings up so you’re ready to beat the competition when they do enter the scene. The data from the study shows that when LSAs are present in plumber search results, top PPC ad clicks do drop, but not drastically. Top PPC ad click percentages when LSAs are absent. Top PPC ad click percentages when LSAs are present. What’s curious about the results is that the first top PPC ad received just as many clicks (9.4 percent) when LSAs were present as it did when LSAs were absent. The number of clicks on the second top PPC ad, however, was cut in half (4.9 percent vs. 2.4 percent) when LSAs were present. This wasn’t consistent with the average results that included all verticals. When all verticals were considered, both the first and second top PPC ad clicks were slightly lower when LSAs were present. What about bottom PPC ads? Well, the results were pretty bleak whether LSAs were present or not. When LSAs were shown in search results, the very bottom PPC ad was the only one out of the three that received clicks, and it only accounted for 0.3 percent of clicks. When LSAs were absent, again, only the very last PPC ad was clicked and that number dipped even lower to 0.2 percent. Surprisingly, these numbers were higher than the average, where click rates sat at 0.1 percent. The takeaway: Regardless of whether or not LSAs have rolled out in your area, it’s still smart to make PPC ads a part of your marketing strategy. There is one caveat though: If you’re using PPC ads to bring in leads, make sure you have the budget to get those top positions in search results. Very few people are scrolling down and clicking the ads in the bottom of search results, so those ads are unlikely to bring many leads. There’s a lot of competition for plumbers, so you tend to need a higher budget for PPC than other home service verticals do. Since you’re spending all that money, you better be sure you’re closing as many of those leads as possible. Check out PlumberMag.com tomorrow for more information on this subject. Carter Harkins and Taylor Hill are the co-founders of Spark Marketer, a Nashville, Tennessee-based digital marketing company that works primarily with service businesses. They’re also the co-hosts of the Blue Collar Proud (BCP) Show, a podcast that’s all about having and living the blue collar dream, and the co-authors of the book, Blue Collar Proud: 10 Principles for Building a Kickass Business You Love. Both regularly speak at service industry trade shows and conferences across the nation. Visit facebook.com/sparkmarketer, facebook.com/bcpshow or facebook.com/groups/bluecollarproudnation.